The 10 micron polypropylene sediment pre-filter to remove suspended materials as sediment, dirt, dust, rust and other suspended impurities down to 10 micron from the water. Removes free chlorine and other organic substances, unpleasant colour, tastes & odours from the water and improve quality. Removes any additional chlorine and organic substances from the water without release of carbon fines. The carbon block prepare water to enter the RO membrane. High rejection (95-99%) thin film composite R.O. Membrane to reject wide spectrum of impurities including Total Dissolved Solids (TDS), bacteria and viruses down to 0.0001 micron. Bacteriostatic resin carbon filter dissolved gases bad taste and odour to ensure fresh and natural tasting crystal clean water. Our team of experts manufacture these SS RO Plant in line with the industry accepted norms of quality and standards. With vast expertise in this domain and backed by dexterous professionals we bring forward an exclusive range of Reverse Osmosis Plant. Aguapuro manufacture and supply a superior quality range of Commercial Reverse Osmosis Units Eco Series, which are available in various sizes from 2000 LPH upto 200 M3/hr capacity. These products are available as per the international quality norms and we offer these products at reasonable prices. We manufacture these products using high class raw materials procured from the reliable vendors to ensure long lasting performance and are having various quality characteristics. We uses the quality Class 1 Pumps for Infeed, Pressure Sand or Multi Media Filters, Activated Carbon Filters, Anti Scalent Dosing Systems, pH Correction and SMBS Dosing Systems, High Pressure Pumps, Membrane Array with Pressure Tubes etc. Systems are provided with Electrical Control Panel for easy operation of system, Wet Panel for Flow control at every point etc. System provides treated water quality which is suitable for various applications including Industrial, Commercial and Residential water requirements. Aguapuro offers complete Range of Commercial Reverse Osmosis Units Premium Series for Water and Waste Water Treatment Plants having a very Large Range and capacities. Aguapuro offers the State-of-the-Art Packaged Reverse Osmosis Systems complete with Pre & Post Treatment equipments offering Very Pure Water from Brackish water. 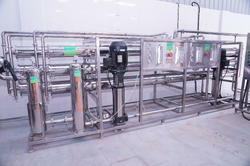 These Systems comprise of Raw Water Feed Pump, Multi Media Filter Unit, Activated Carbon Filter Unit, Anti Scalent Dosing Unit, (Optional-Water Softener) Micron Bag and/or Cartridge Filter and Reverse Osmosis Unit with Optional UV Sterilizer unit at the outlet of RO unit. These systems are used for water having TDS up to 2000 ppm. Systems for Higher TDS are custom Designed and offer for the same can be procured from AGUAPURO Sales division. AGUAPURO offers these capacities in this series, ranging from 100 LPH to 2 M3/hr and more. Two Stage RO Systems For High Purity Applications and also called Drinking Water Filters, are designed to produce water which is used in various industry. 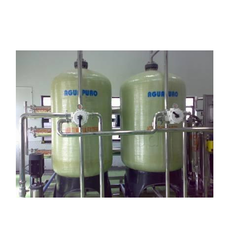 Water of First RO Product (Permeate) is fed to the 2nd RO system to get ultra pure water. In case of further treatment for some high water quality requirements, we offers, Mixed Bed unit or Electro De-ionisation units of various capacities. These systems are available for any capacity between 200 Lts per hour to 10000 ts per hour. Bigger capacity systems are available on customer requirements. The Aguapuro series of Domestic Reverse Osmosis Units provide proven, highly reliable and cost effective treatment of a wide range of brackish waters, Designed with flexibility in mind, the series utilise state-of-the-art spiral wound reverse osmosis membranes to suit a given application. These systems can remove 90-98% of total dissolved salts with minimum instruments and controls. 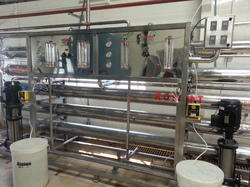 Product flow rate 1.2 - 60 m3/h. Salt rejection ranges from 90 - 98% depending upon feed water composition. Product recovery ranges from 50 - 80% based on feed water composition. Electrical 415 V, 3 pHs, 50 Hz. Concentrate discharge directed to drain at 'O' psi. Modular design - capacity can be increased to suit requirements. Fully assembled skid tested prior to shipment, ease of installation and beneficial use. Non-corrosive low-pressure piping - virtually maintenance free. User-friendly unit - does not require continuous monitoring. Poly propylene cartridge housing pre-filter. 16 stainless steel multistage pump. Motor starter with a disconnect switch. Motor contactor with thermal overload protection. Feed and concentrate pressure indicator. 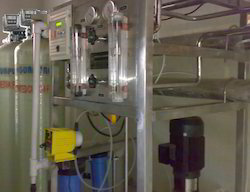 Product and concentrate flow meters. We provide RO Plant , An economical way to obtain pure water from brackish water Scarcity of good quality water has increased our dependence on ground water sources. This brackish or saline water is unfit for drinking or for industrial use unless properly treated. Reverse osmosis, a membrane desalination process increasingly used worldwide, purifies brackish water for drinking and industrial purposes. Reverse osmosis membrane technology produces water with very low dissolved solids and which is also free from particulate, colloidal and organic matter. Efficiency: Removes upto 95% of total dissolved solids (TDS) or salinity to produce water that is clear and pleasant to taste. The most economical & efficient method of dissolved solids removal. Easy to start up and uses very little space on installation. Can handle fluctuations in feed water total dissolved solids. As retrofit to demineralisation plants in industries to reduce regeneration chemicals. We offers Industrial Reverse Osmosis Unit for industrial applications for capacities from 2000 LPH to 100 m3/hr. These systems are provided with pre treatment of filtration of multi media and activated carbon followed by micron filtration. Systems are offered with systems recovery of 65% - 85% depending on the in feed water quality and application. We offer a wide variety of products used in Reverse Osmosis Systems such as portable water generation, Brackish water, sea water desalination and effluent recycling etc. We bring a combination of RO & UF system for the power plant, pharmaceutical & high-quality process water. 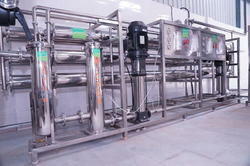 Neutech offers a wide range of packaged drinking water system ( mineral water plant ). For large-scale plant complete turnkey solutions offers. 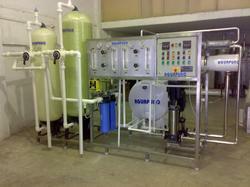 We are offering Reverse Osmosis Equipment to the clients. 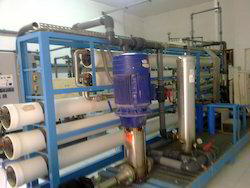 This type of reverse osmosis plant can be configured easily as per the individual requirements of output water. 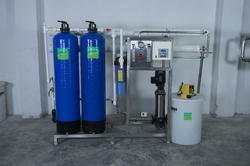 We are engaged in offering Industrial RO Water Filter to the clients.